All this time I thought it was Beepy that our little friend Buzzy yearned for. Turns out, he is madly, passionately, deeply in love with Dialysis Tech Extroidonaire...Miss Lorie (standing left in the photo). I'm here in the chair with both needles inserted with nary a problem and the machine running full speed ahead. 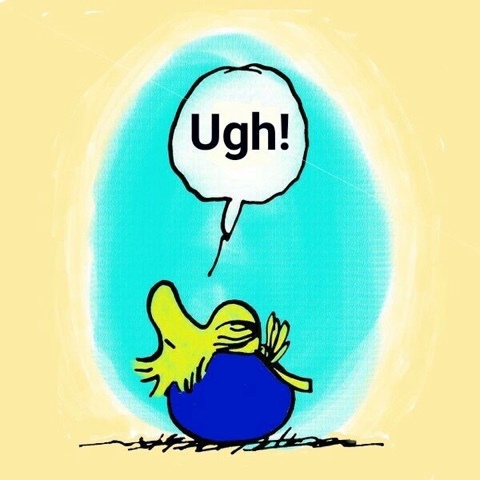 I confess to a very long and sleepless night of worry and wonder if I would have a repeat performance today, but all of that anxiety was for naught. I am cannulated and 100% pain free. My Irish did not fare very well against the mighty tigers of Clemson, but I did enjoy myself nonetheless. There was plenty of ice cold lemonade (for me) and various and sundry adult beverages for Magoo and friends. There was also fabulously delicious bar-be-que, and since we all know how much I hate to miss a meal, I enjoyed a few bites of things before coming to my senses and pushing the plate away. Magoo's friend Fish should be arriving on the train as I write this, and I think the plan is for Rich to take him on a tour of Notre Dame while I'm finishing up here, and then I'll join them for dinner later. In anticipation, I made sure to apply a bit of makeup this morning...an event that has my podmates stunned and suspicious that I am not really me today. I am very very close to finishing the Prairie Moon piece and hope to do so this evening after dinner. 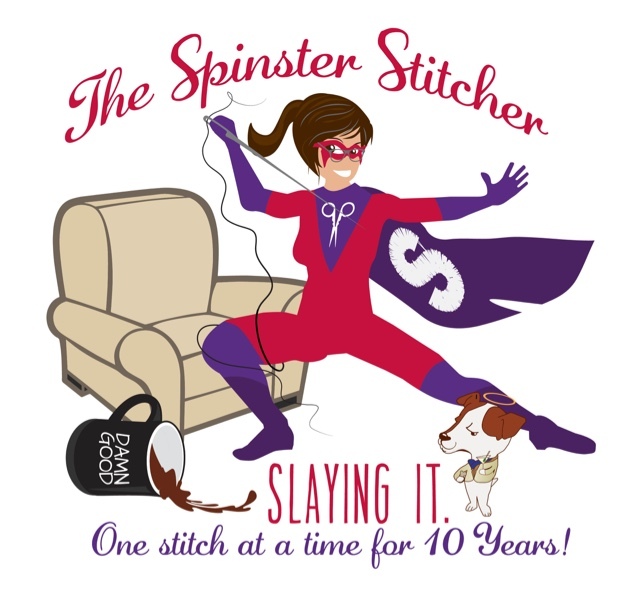 Then, tomorrow and Tuesday will be spent gathering my January basket for the start if the 2019 Spinster Stitcher Remembrances of Stitchy Things Past Official Stitchy Plan. I'm quite excited about this, actually, and think it will be very much like going to a high school reunion...seeing old friends and thinking about good times together, and picking up where we left off. OK, enough chattering away. You've got better things to do than listen to me babble away, and I need to behave myself and finish treatment. Happy, happy Sunday, Dearies! I hope your day is wonderfully swell and that you get to do everything your heart desires! Well, Dearies, we had a bit of dialysis drama here in Hoosierville. I went for my treatment yesterday and got situated in my chair. The first/arterial needle went in well enough, but the second (and in my case longer) venus needle was causing all kinds of problems. Three different techs tried and tried, but no matter how much they monkeyed with it...it just wasn't cooperating. So they decided to try again, but much higher up on my arm...almost to the shoulder. 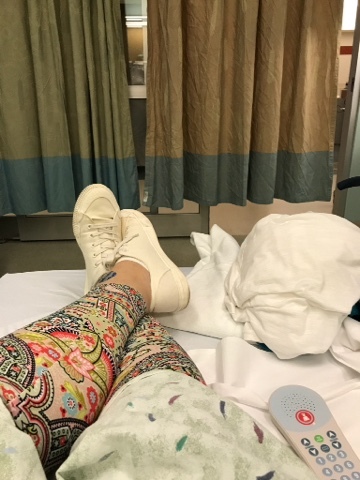 I thought I was doing remarkably well with the pain...thinking about stitching and Stewey and happy things, but a hard crash ensued and before I knew it, I was in an ambulance heading to the emergency room. They though I was having a heart attack! All I said was..."Gee, kids. 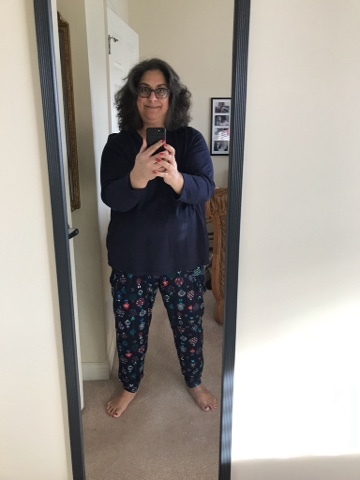 I have a sharp ache traveling up my arm and under my collar bone, I can't seem to catch my breath, and I feel like an elephant is sitting on my chest." Before I knew it, I had oxygen in my nose, blue lips, an aspirin in my mouth, and the most handsome man I had ever seen lifting my left boozum to attach leads for an EKG. Apparently, heart attacks in women are much more problematic, since our symptoms are so different. I personally think that we just manage pain differently. Men clutch their chests and fall down. We take a moment to fix our lipstick and wash a load of towels on our way out the door because we've got things to do, after all. I got checked out stem to stern at the hospital and came home with a headache and the desire to just go to bed for the duration, which is exactly what I did. No heart attack, thank God. Just a "syncopal episode brought on by pain". In layman's terms...I passed out because it hurt so bad it fritzed my tiny little brain. I will try again tomorrow. This time I will speak up if I feel like it's getting away from me, rather than grit my teeth and breathe through it, if for no other reason that I really don't want to ride out of the pod on a guerney with lights and sirens and my fanny flapping in the breeze. So that's the news I have for you today. We are scheduled to head out to watch the Cotton Bowl (GO IRISH!) at a local establishment, but I need to get my wits about me first. I hope things in your corner of the world are consideranly quieter and that you get to do everything your heart desires this weekend! Do something fun and...well...you know! I'm off to an appointment this afternoon, then it's home to Prairie Moon's Holiday Farm. I decided to continue stitching until complete, which hopefully will be very soon! My tomorrow will be occupied with You Know What, Saturday is the Cotton Bowl (GO IRISH! 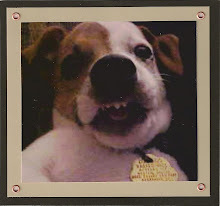 ), and on Sunday I have You Know What again followed by a visit from an out of town friend of Magoo's. 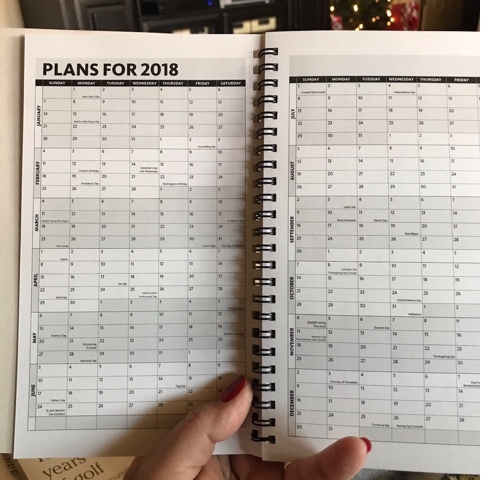 That gives me Monday and Tuesday to get my stitchy act together and implement my system for the new year...go back through this here blog and put a basket together of everything I was stitching in that month from 2008-2018. Brace yourselves, Dearies. This is either going to be a lot of fun or end in tears and recriminations. Hopefully, there are no tears in your corner of the world and you are off to a wonderful adventure. Do something fun (and maybe a little naughty?) today and come tell me all about it! CHRISTMAS EVE SPINSTER MERRY BLISS. Freshly showered. New Christmas jammies on. Fettuccini with scallops, spinach, shallots, and sun dried tomatoes. 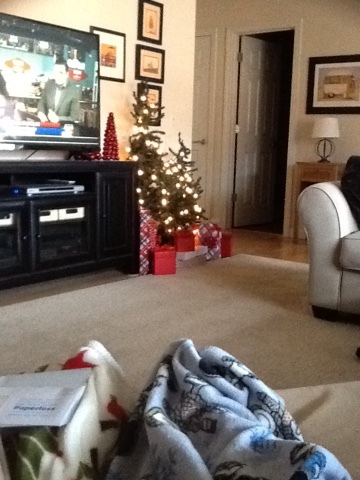 Charlie Brown, magic blankets, and Christmas lights. Dearies, my heart is joyful and light. 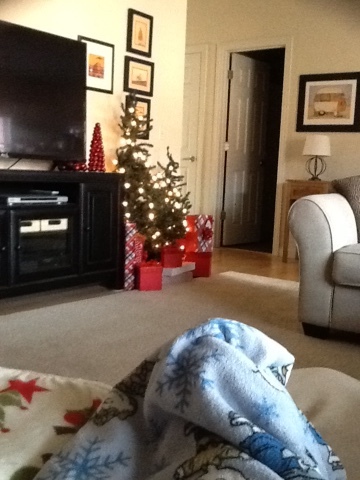 I am sitting in my Happy Chair wishing that all Christmases could be this happy. 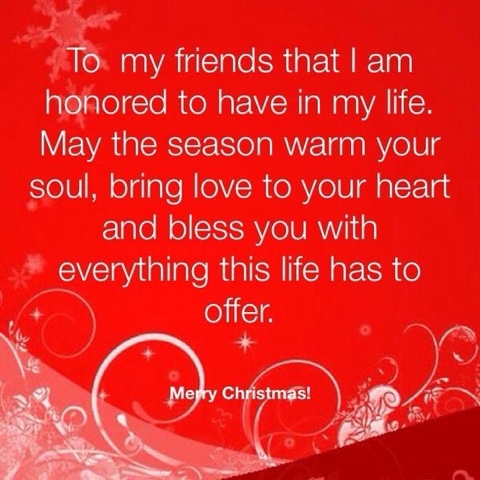 My prayer is that you and yours find your very own bliss and that sugarplums dance in your dreams tonight! 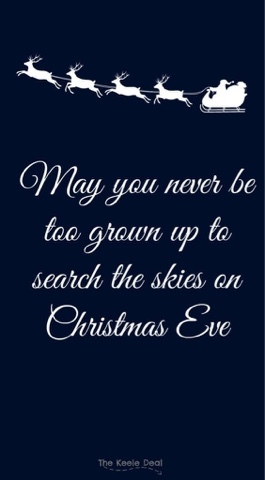 Happy Christmas Eve, my friends! Only heroes and lunatics are up at this ungodly hour. I don't see a cape anywhere on my portly person, so I suppose that makes me a lunatic. Oh, my goodness, Dearies! This was an interesting mad dash to get here this morning and get hooked up. I must be still half-asleep, because before I knew it I was showered, dressed, in the car, and then here in the chair doing my thing. Hook up went super well, but I gained 11pounds of fluid since Friday! Well, I'm not going to let this deter me from my ham plans. I will still indulge, but maybe take it a little easy and not eat the entire thing in one sitting. 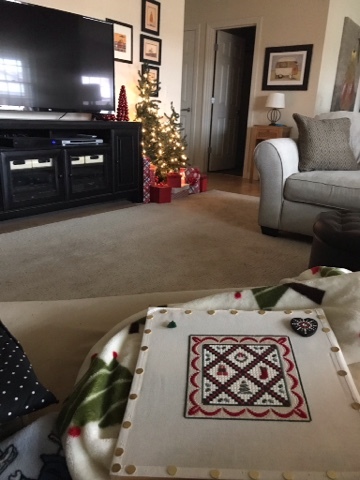 Thank you for your cheering me on to the finish of the Christmas Quilt. 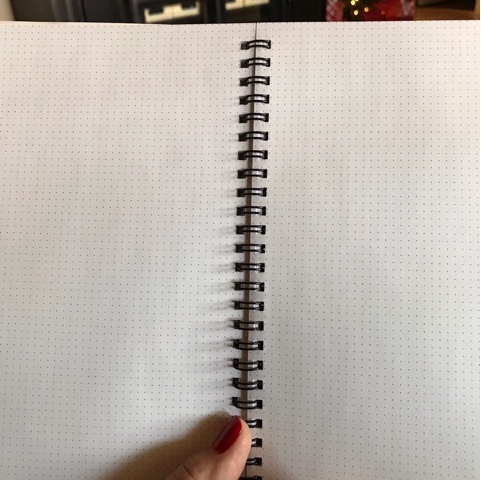 It was such an enjoyable stitch once the thread issue was resolved, and I learned my lesson with respects to journaling. So it's a win win win all around! I'm going to settle in with some Flosstube now. They've got me in the "pit" today which is dead center in the unit and just to the right of the patient entrance. I feel very much like a greeter at a casino. Or a Walmart. I hope you have a wonderful Sunday! The countdown has begun to You Know What! Are you ready? Y'all know I dearly love Mr. Magoo...I really do. But I also dearly love my spinster alone time when he goes back to New Jersey. I would feel bad about that fact, were it not for the 30 plus years I spent as a single gal about town. I have lived on my own and done my own thing from the age of 19, so adapting to life with a companion is still a little new to me. Anywhoose...my alone time has really been quite wonderful. I finished up in the d-chair yesterday afternoon and decided to have Chinese food for dinner. Magoo doesn't care for Chinese food, so it is a rare treat for me to go face first into some General Tso's and veggie fried rice. Which is exactly what I did after coming home, washing my face, and changing into my pajamas. 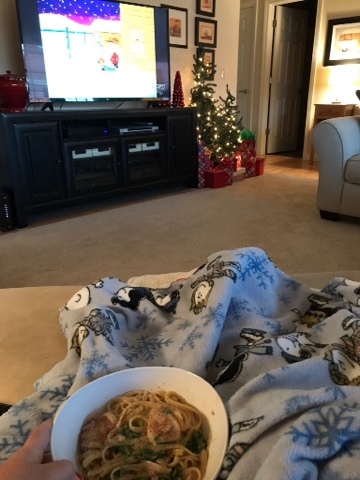 I sat on the couch with my Chinese food and watched Housewives, a little bit of the news, and then managed a little snooze right there in front of the Christmas lights. Then I woke up, had some fizzy water (to kill the heartburn from the Chinese food), and watched two movies...Breakfast at Tiffany's and The Way We Were. After a really good sleep, I am in the Happy Chair with my damn good, the Saturday newspaper, and a pad of paper...planning my grocery list for later today. My damn good is peppermint mocha! I'm not normally a fan of flavored coffee, but I found a box of pods in the back of the pantry that I think I picked up at the Christmas Tree shop last year, and I decided to use them up. Delicious! This one is called Christmas Thyme, and is a very lovely pine scent. I burn Yankee Candles and normally like Sage and Citrus only. Anything "sweet" smelling gives me a sick headache, but I ventured out a bit and decided to try a few other ones recently. So far, Kitchen Spice, Sparkling Cinnamon, and one other that I forget the name of have been swell. I also picked up a jar candle from the Michael's called Autumn Walk (for a whole dollar!) that was really good too. What can I say? I'm totally a low maintenance gal, except when it comes to scents. My menu has changed about ten times, but I think I finally have a winner. Today and tomorrow I'm going to have Philly cheesesteak sloppy joes because they'll be easy and I can make them with 95% lean ground beef. 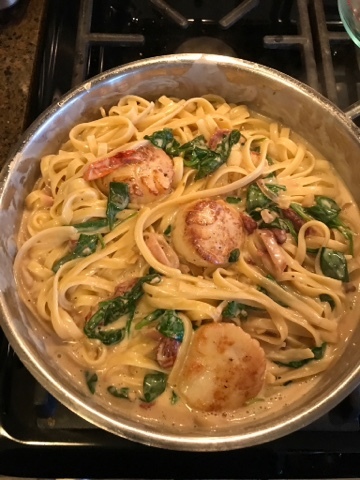 On Monday night I am going to make a seafood fettuccini with shrimp, scallops, spinach, and sun dried tomatoes. And on Tuesday there will be ham. Lots and lots of ham. My chair time will be 7am tomorrow morning...yikes! 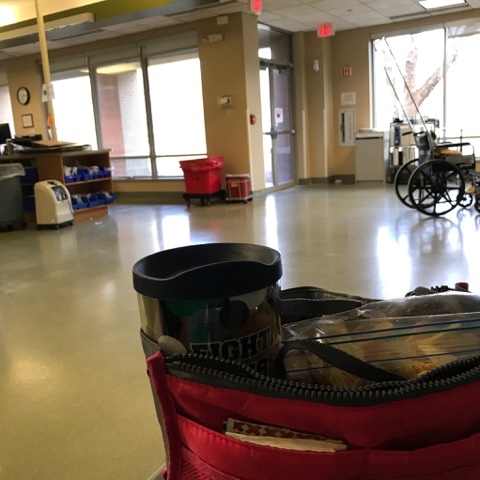 But, I am happy to haul myself out of the big girl sleigh bed early so that I can be done by 11 and the techs and nurses can get everybody through and then off to their families early. I think there will only be a few of us tomorrow because so many people travel or can't get transportation on Sundays...so I hope it will be easy peasy. Well, Dearies...I suppose that's all I have to report today! I'm going to get myself dressed and over to the Martin's so I can get back here and stitch the day away. I hope your very own Saturday is perfectly swell and that you get to do whatever makes your skirt blow up and your heart sing! Come tell me all about it! Oh my goodness, what fun I had yesterday! After chatting with you, I got myself clean and shiny and headed out to the hinterlands. This is first thing that greeted me when I walked into the Michael's! 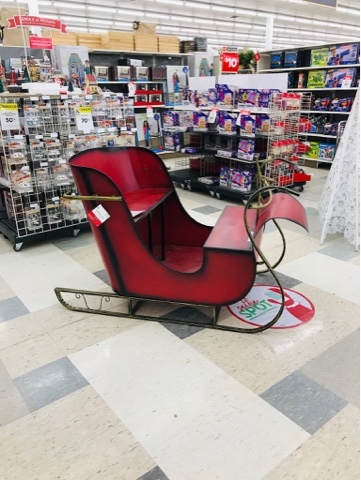 When I built my little dream house in 2004 I declared that I wanted a big red sleigh for my front yard filled with presents. I swear to you on all that is holy...I looked and looked and looked for one every year for twelve years, but alas, I could never find one. Today i am in the d-chair doing my thing, Dearies! I will have tomorrow off to do a little more grocery shopping, and then it's back to the d-chair on Sunday so that we can have both Christmas Eve and Christmas Day off. So that's it for now...just behaving myself and looking forward to a latte on the way home as my end of week/attendance treat. Who knows? I might get jiggy with it and go peppermint today instead of cinnamon! What's jiggy in your neck of the woods today? Come tell me alll about it. Well, good day and cheerio, Dearies! 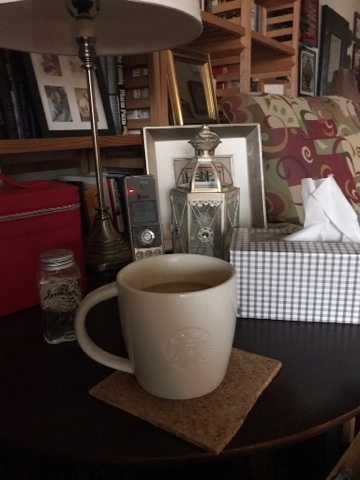 It is almost noon and I am in the Happy Chair with my second cup of damn good and the paper, freshly rested, feeling fantastic, and ready to tackle a Thursday. I slept very well (and for a long time) in the big girl sleigh bed last night, and since today is an "off" day, I get to do whatever I darn well please! Miss Lori got me hooked up and told me to "sit quietly and play with your toys", so I did just that. 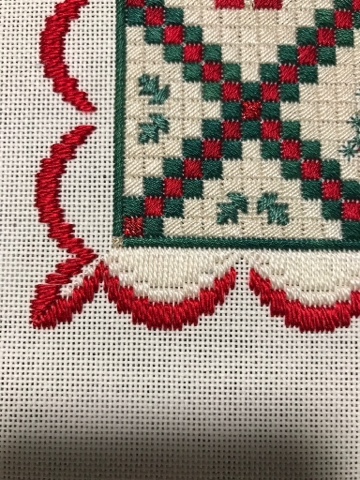 I somehow managed to almost complete two sides of the inner border, and did so while listening to Christmas music in my headphones. I didn't get "crashy" until the very end, and managed to remain conscious and upright almost the entire session. Last night I was a bit sleepy, but Magoo and I watched a few episodes of "Escape at Donnemara" on the Showtimes, and then a bit of the 76ers game. I wanted to stitch, I really did, but my eyes just wouldn't cooperate and kept closing. Today I am going to run to the Michaels, the Targets, and the Martins. I want to check out something I saw on Miss Caroline's Flosstube (Off The Grid)...small frames with aida already attached and stretched. 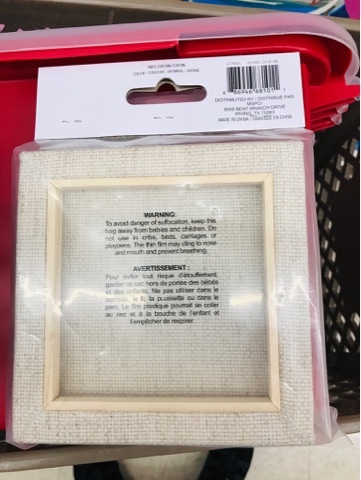 I believe she said she found them at Michael's, and they look perfect for small quick ornament projects. Target will be uneventful, alas. Only a prescription that I have been out of for two days. (Yikes!) 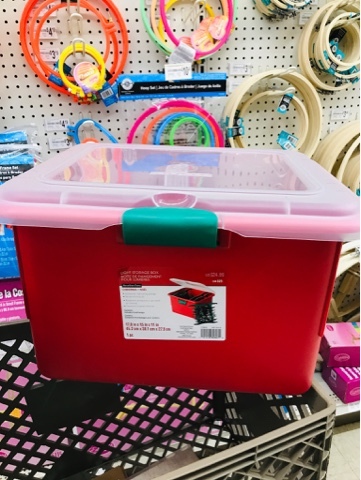 I am normally much better organized about keeping my pill boxes full, but this time it got away from me and they had to place a special order. Martin's will be the best stop, because I'm shopping for my Christmas feasting. I decided on shrimp cocktail, stuffed shells and a lovely salad for Christmas Eve, and ham, etc for Christmas Day. I might also gather a few little things for an antipasto, since it is very likely that Monday will roll around and all I will want to do is "pick". I also need to replenish my d-chair snacks...grapes, Vitamin water, pretzels, etc. I normally try to get those things at the Costco, but my sherpa is in New Jersey at the moment visiting his mom for Christmas and I don't feel like lugging big boxes up the steps today. Goodness gracious, will you listen to me prattling on about the most mundane details! I'm certain that there was a time when I had a lot more interesting things to report, but...this is my small little happy quiet life for now, so...so be it! Happy, happy Thursday, Dearies! 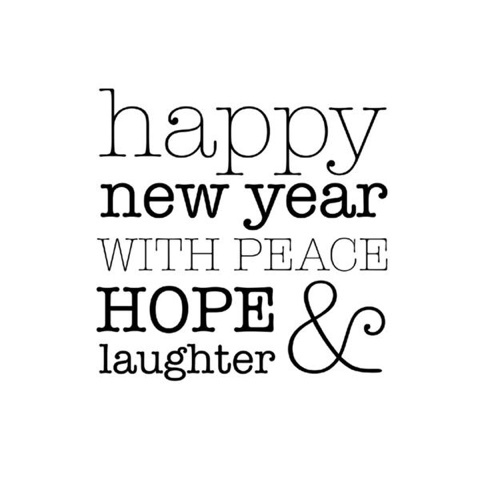 I hope you are having a wonderful time of it no matter where you are. Do something fun and come tell me all about it! Just a little bit of stitching from last night, Dearies. I thought I would have about five or six hours of uniterrupted time in the Happy Chair, but alas, I kept getting distracted by laundry or menus or grocery lists or something on the TeeVee or the iPad thingie. The borders are coming along...I started to doubt my choice of perle cotton, but got that out of my head quick, because this will become the Project That Would Not End if I keep up my thread shenanagins, so #8 it will be. The sun is shining today, and if I didn't know any better I would think I could hear the birds sweetly tweeting, but methinks they are cozy in their winter nests and not out galavanting. But it does look rather spring like...at least from the friendly confines of CS2 and its whopping 65 degrees, so I suppose one can dream. Nothing else to report thus far, which is quite OK with me. 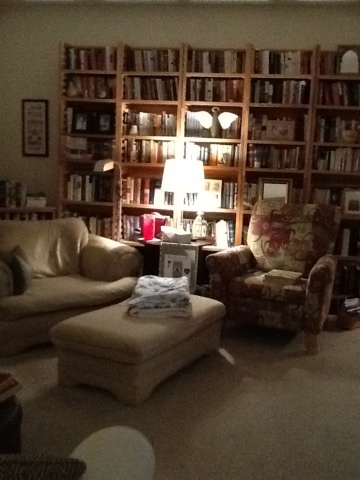 In a minute I will pull up my socks and head to the d-chair and what I hope will be a good and quiet day. Happy Futzingday to one and all! I hope you get to have a perfect day, my friends. Come tell me all about it! 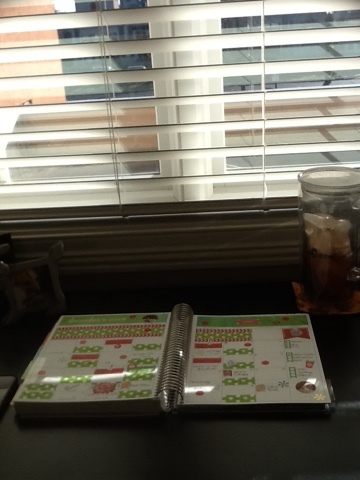 Today is a day to sit at the big girl desk and tend to things. 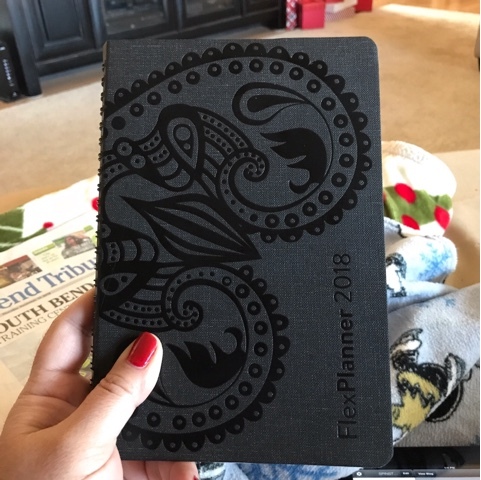 So far I've managed to look at blogs, Flosstubes, the Amazons, 123 Stitch, and a few dozen trailers for movies that are coming to theaters soon. My nails and hooves are freshly painted and I think I have dispatched the pesky beard and mustache situation for the season (or week, depending upon my 52-year old hormones), and now I am determined to plan my menu and shopping list for Christmas Eve and Christmas Day. There will be ham on Christmas Eve and Christmas Day....just like every other year I have been on this planet. Ham and scalloped potatoes and green bean casserole and biscuits and fruit salad and jello and coffee cake and Greek cookies and salami and cheese and crackers....and that special diet Sprite with cranberriers to wash it all down with. 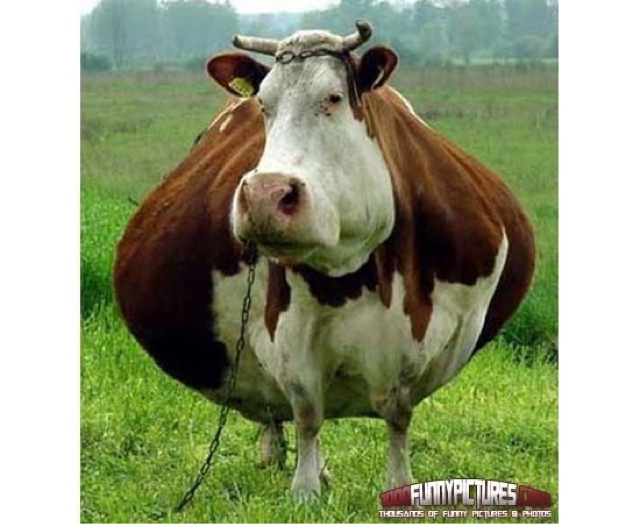 Hmmmmm....maybe it's time for something to eat. Nope...need to buckle down and get a few things done so I can stitch without guilt tonight. 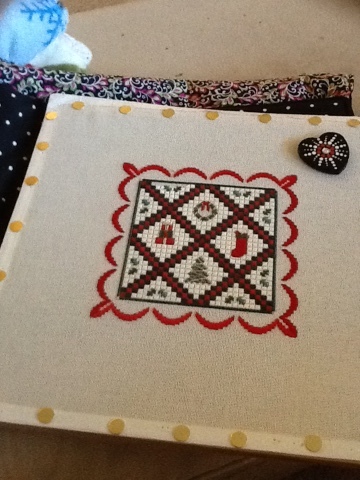 That LJP Christmas Quilt isn't going to stitch itself! I'm home from the chair and heading in for a nice nap with my face in the sun. Hook up was...ugh...but Miss Lori cane in early so that she could be the one to show Buzzy who's boss. She is my regular tech, and I think she has learned the ins and outs of how to properly put both me and my arm in its place. The sun is shining today, which makes me happy, but I wouldn't mind a little snow. I was commiserating with a stitchy friend that a white Christmas is mice, but knowing that people can travel safely to and fro is even better. More later, Dearies! 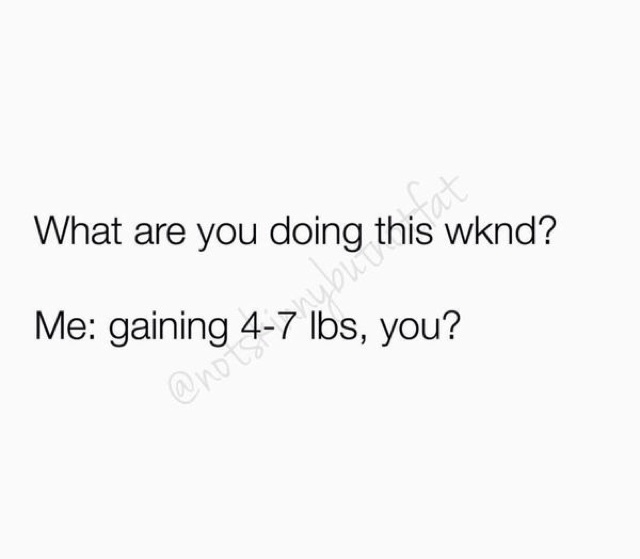 Just wanted to check in! 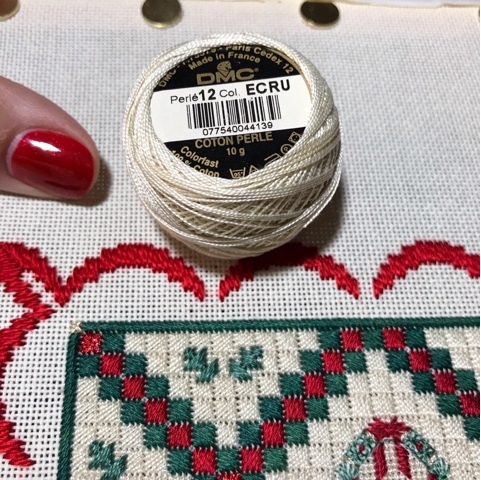 How many attempts at thread matching does it take one portly spinster to try over the course of a month and a half because no matter how convinced she is that she has finally found it...eh...not so much. It wasn't Trebizond after all, Dearies! It ended up being #12 perle cotton in ecru. I tried the Trebizond in two different colors and perle #5 and perle #8, but I had not considered perle #12. So just when I was about to chuck this off the balcony, I rummaged through the cube room studio and found this poor lonely little ball of #12 cotton just looking to be played with. Now it's on to the outer borders, which I have already decided to do in #8 ecru for a little textural contrast, and then the outer outer border in a lovely deep dark green. Stay tuned! I'm sensing a fee nee coming soon! After a Notre Dame women's basketball game at 1:00 today, I am coming home to stitch. I have to say, this was a very enjoyable stitch. Why I put it down for a hundred years is completely beyond me. 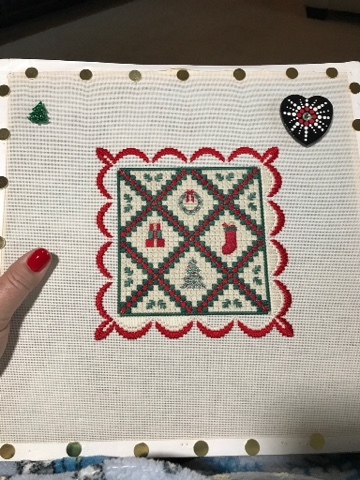 If I had brains, I'd go ahead and finish this by stitching the border and then get it into a pretty frame for next year's Medium Sized and Half Assed Wall of Very Sincere Christmas Stitching. 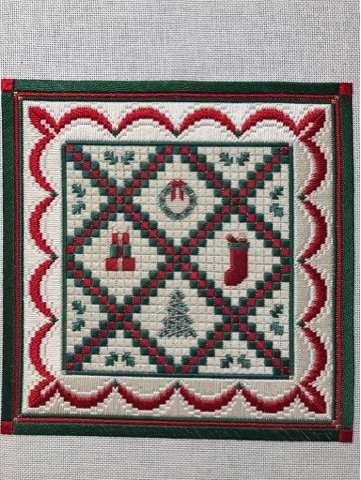 This is Laura J. Perin's Cjristmas Quilt, and I'm stitching this on congress cloth instead of the called for mono canvas. We'll have to see how far I can get now that I have the correct thread in hand (which was indeed Trebizond Parchment). Thank you to all of you eagle-eyed stitchy pals who scouted this for me! Well, I suppose I better get moving, since I don't think I can wear my slippers and pajamas to the game. Happy Sunday, my Dearies! I hope you get to have the exact day you want! HOW THE HECK DID THAT JUST HAPPEN?!?! I'm not sure what happened exactly. 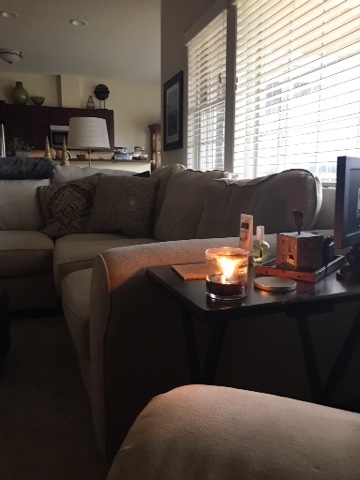 One minute I was sitting here having my damn good and a Greek cookie and the next thing I knew I was back in the Happy Chair, freshly showered, under my blanket, and breathing a huge sigh of relief that things are officially clean and tidy. 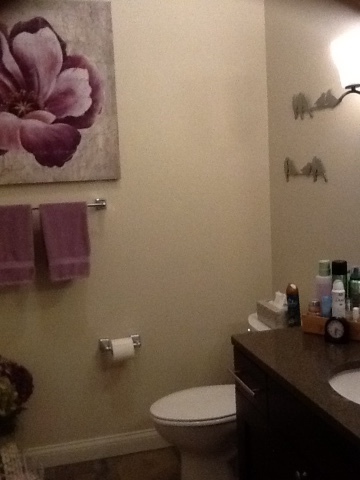 I mean really clean and tidy...baseboards, walls, floors, rugs washed, and bed changed clean and tidy! I even took the damn good maker apart and washed it! Pantry, inside and outside of the fridge and freezer, and windows now all sparkly clean and looking like somebody lives here that has some sense in her head. Magoo is happily watching a basketball tournament thingie on the TeeVee that's taking place in Atlantic City's Boardwalk Hall. His brother is actually there and we are trying to see him sitting in the stands. I kept waving like a crazy person until Magoo gently pointed out that Joe can't actually see us even though we can see him. OK, Dearies. Now I'm off to get some stitchy time in before bed. 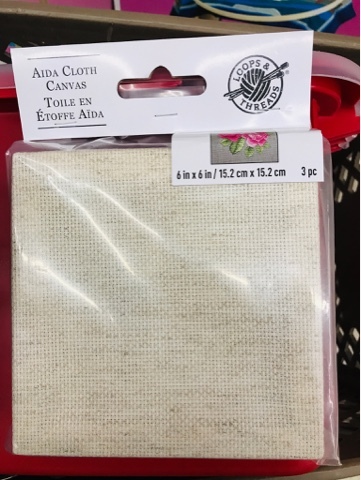 The Parchment Trebizond arrived in the mail today so I am going to see if I can get the Christmas Quilt nearer to a completion. I hope your Saturday was wonderfully swell! (*) CS2 means Chez Spinster 2...the original Chez Spinster was my little house in Mishawaka. Well, Dearies...we somehow survived that crazy week. High highs and low lows for sure, but the weekend is upon us and we're marching forward, right? OK, so maybe not so much with the marching...more like shuffling gingerly...but we'll get there either way I suppose. To answer the several dozen questions I've received about Buzzy...he has several problems, not the least of which is a big aneurysm/bump right in the area that they need to stick me. The surgeon requested that we not do that anymore and go above it, but that means having to go very deep. And unfortunately, the closer you get to the shoulder, the more tender it gets, so it's pretty much like having surgery while awake. The do make lidocaine cream that you can apply to the skin, but I was told that it will eventually break the tissue down, and I figured a few minutes of pain would be easier than a lifetime if wound care. But after yesterday...I might reconsider that decision. 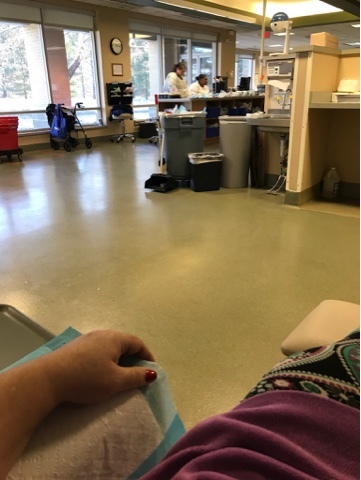 I have developed an extremely high tolerance for pain and usually go to my Happy Chair in my head and stitch and pet Stewey while they're working away, but yesterday I passed right out and came to on my head with blood all over the floor, a team of people standing around me, and wanting to be anywhere else but there. But the good news is that I apparently muttered "mother of pearl, jimminy crickets, and fudge and fiddlesticks" rather than the OTHER alternatives in my head, so I've got that going for me. But today is Saturday and we don't need to think about needles or Buzzy screaming bloody murder for another few days. The sun is shining and I am seriously considering a walk once the hangover lifts. Then I might try to tackle some laundry and cleaning, but if I don't...I don't. Nobody is coming to visit and if I want to live like a frat boy on the top floor of Animal House, I shall. On the stitchy front, I don't really have any plans/goals other than to do some. I'm still really enjoying all of the pieces in my basket, but wouldn't be totally against starting something new this afternoon or tomorrow. We'll see. Time for my second cup of damn good and a little breakfast, Dearies. 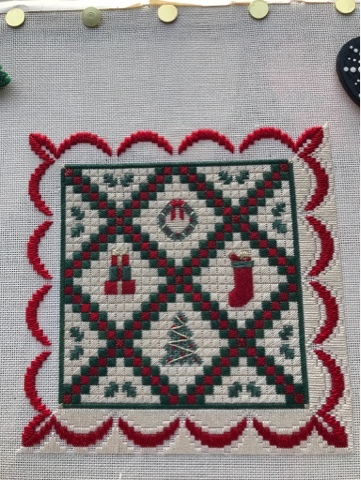 I hope you have a wonderful day and get to spend some time with needle and thread! Come tell me all about it! Well, I suppose it is the perfect ending to a crazy week, so I shouldn't be too surprised that it happened. Hook up in the chair took three techs, a nurse, oxygen, and more swearing and screaming than even I thought possible. Wow. This one will go down in the record books for sure. 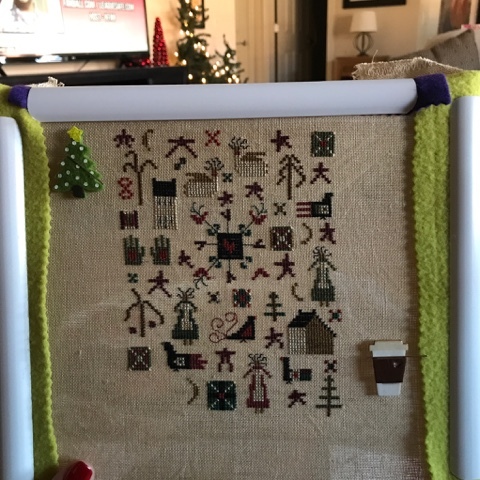 The only thing more painful would have been frogging over one stitching on 40count linen using a limp piece of wet licorice in a dark closet. Well, here we are, Dearies! Friday at last! The week has been...interesting to say the least, and I am definitely ready to have a few days to re-gather my one remaining wit. 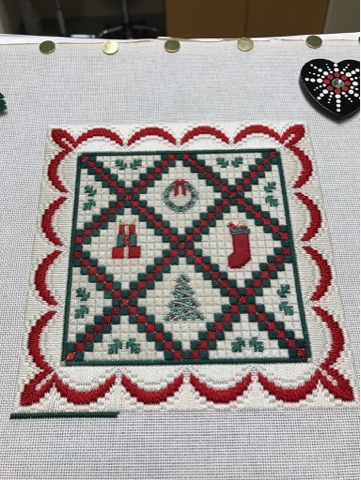 Only one more little moteef to go on the inside of the Prairie Moon Holiday Farm piece, and then it's time for the border. If I can, I'd like to start something new and maybe put a few stitches into another piece from the basket. 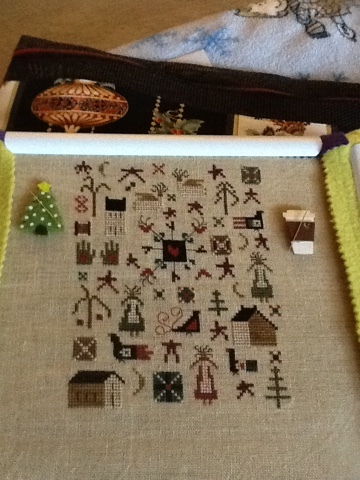 December is flying by and I am nowhere near where I'd like to be stitchy wise! No plans for the weekend. 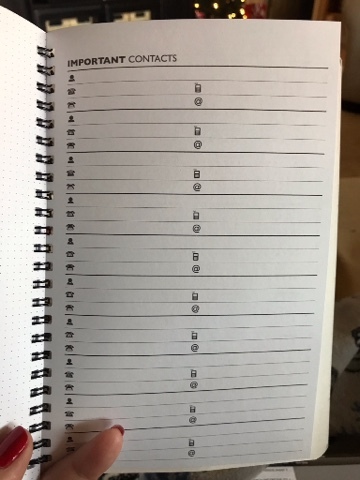 I thought about writing a nice long to do list, but we all know how that usually goes, so I'm just going to let it unfold naturally and see what happens. Here's hoping that your very own weekend is exactly what you want it to be, Dearies! Do something fun and come tell me all about it! I forgot how much I love going to the movies. As a stitcher, I am so used to just listening to things on the TeeVee that I forgot how nice it is to just lose yourself in a story for a few hours! 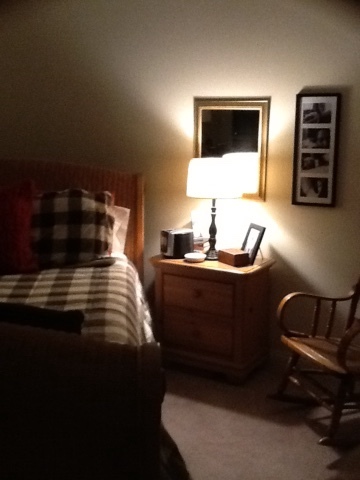 Well, I guess I better go tuck myself into the big girl sleigh bed now! I hope your very own Thursday was simply swell....I know mine was! The journals would cost $20 each. Approximate US shipping cost would be $6. International shipping quoted upon request. Cover is heavy embossed textured card stock. 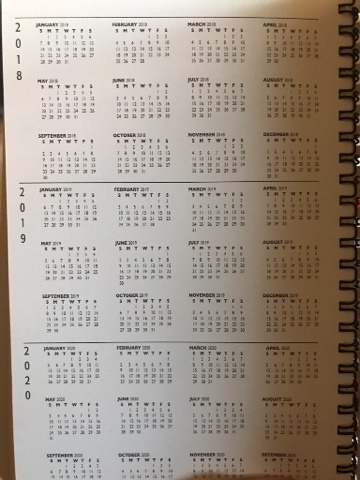 Text would be "Stitching 2019"
If ordered before December 20, they would arrive on/before January 31. What do you think, Dearies? Dearies, I have a question for you that has been in the back of my stitchy brain from the moment I started stitching. What do you do with your working threads when you're stitching? In other words...let's say you're stitching with DMC221 and the chart calls for two strands. So you pull a nice long length out of the skein and then strip out the two ply that you need. What do you do with the remaining length of six strands? And then, after you've stitched the few stitches of that color and snipped off, what do you do with the leftover that is still long enough to do another area? I'm using FlossAway bags for my Prairie Moon project, but am stumped over what to do with all of the working threads. Thanks for your advice and expertise! I woke up at 6:00 this morning with a migraine and the stomach flu. The first several hours were pretty rough, and I spent more time on the bathroom floor than I would have liked, but I am now freshly showered and in the Happy Chair with my new blanket, stitching, and diet 7up for company. 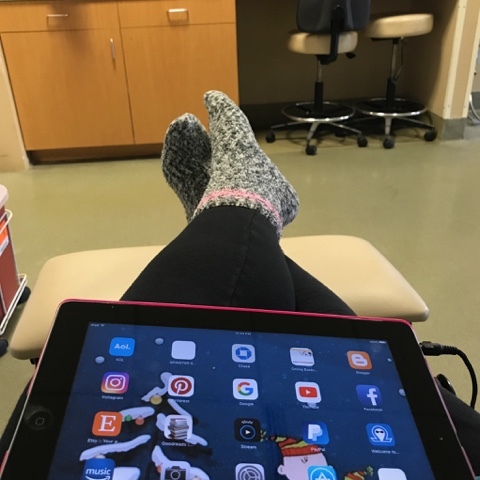 I called my d-nurse this morning to ask her what I should do about treatment today, and she wholeheartedly agreed that hooking me up to the machine while I am under the weather would just not be very much fun for anybody. Tomorrow will be another free day, aside from a Dr. Melfi appointment. I am determined to go to the movie theater to see a movie in the early afternoon and then out for a simple light dinner. I told Magoo that we seem to be in a very bad rut now that golfing is kaput for the year, and if I'm not careful I'm going to revert to my old hermit spinster who doesn't leave the house for eight years ways. Besides, I would really love to see a movie in a theater, since I haven't done so in what feels like forever, and there are several that sound good...Creed II, The Greenbook, A Star Is Born, The Favourite, Bohemian Rhapsody...and let's not forget...Miss Mary Poppins Her Very Self coming on the 19th! Other than that, I don't have anything new to report other than a big fat THANK YOU to all you Dearies who reassure me that it's OK to just be...me. 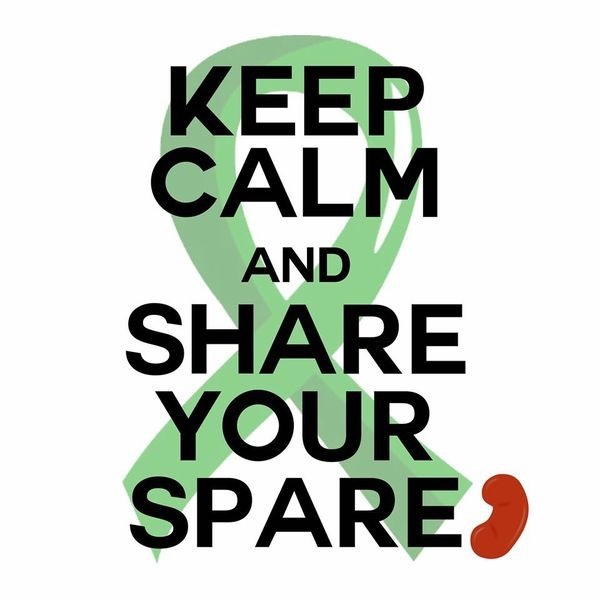 When I go to the chair on Friday I am going to take my stitching and lap stand with impunity, and the next time I feel all squirrely about something I'll channel you voice as my inner and just get on with it. Now for some stitching and 7up. Just what the doctor ordered! How is your Futzingday? Please tell me that you are warm and safe and dry and that your needles are flying! Come tell me all about it! I'm in the d-chair doing my thing, and the gentle cooing and patting of the techs and nurses is exactly what I needed apparently. I wasn't here five minutes before somebody asked me how my appointment went yesterday, and I immediately went into a fullblown ugly cry with sniveling and pitiful tears staining the front of my big girl sweatshirt. I think I'm just tired and feeling sorry for myself...a feeling that I don't care for one little bit. I'm the girl who wants to hitch up her drawers and say "I've got this!" before doing something impossibly brave. But, as I'm finding out, sometimes you just need to be a weepy mess and let somebody else push the rock up the hill. Today that task falls to my team here, so all I have to do is snuggle under my blanket and watch something lovely on my iPad thingie. Methinks it will be Flosstube or watching people color on the internets...both of which make me very calm and reassured that the world is indeed a happy place. Miss Ruth from Beadecked and Beadazzled has come to the rescue with some spools of Trebizond in Parchment, so as soon as they get here I should be able to get back to my LJP Christmas Quilt. 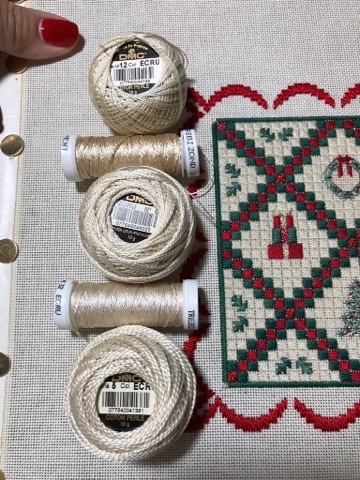 Then, if all goes according to plan, I hope to gather the threads for her Christmas Ribbons piece and get it started and underway before the end of the year. I have everything I need except Kreinic blending filament (which I've never used) and Threadworx perle cotton. In the meantime, I want to get back to the Prairie Moon piece. I contemplated bringing it to the d-chair, but there are an awful lot of thread changes, and that can be quite a production with only one hand. I think I am also a bit shy about hauling my lapstand with me every time, since it looks like I'm moving in with three huge bags of stuff. Maybe if I consolidate better it won't be so obvious...or maybe I could find a big wheely bag that would sit next to my chair out of the way. What I do know is that I need to make these three days a week a little more pleasant and productive, or I'm going to go even more nutso than I am now. This is a grind for sure, so anything I can do to make it part of a "normal" week would be swell. My goodess graciou! What's with the blathering on endlessly, today?! I guess I forget that y'all actually have things to do and lives to live and places to go and people to see! Tonight will be salmon and broccoli. Happy Eh...day! The sun is shining and the bells are sweetly ringing! Here's hoping that it's that way in your neck of the woods! I'm channeling my inner Stewey today and burrowing under the blankets and staying here for the duration. I grabbed an open chair time tomorrow at noon, so I'll have a Tuesday, Wednesday, Friday treatment schedule this week because the thought of having to go to dialysis today was more than my poor little brain could handle. My appointment with the surgeon this morninig went about as well as it could have. He took one look at Buzzy and scheduled me for revision surgery on January 15. 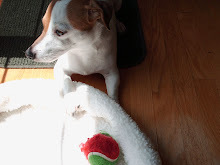 The problems I've been having with him (Buzzy, that is) are the result of a huge aneurysm that has developed, as well as complications from the stents and coils and angioplasty that have been done to maintain good access. 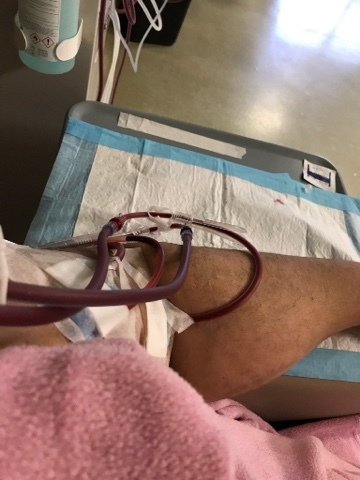 It feels very much like a Sharks and Jets kind of thing between the surgeon and the interventional radiologists and my dialysis team, but I trust that the advice I got to have revision surgery is sound...so off I will go. I spent about five minutes on the car ride home bawling my eyes out over this turn of events, but now I think a little time in the cube room studio and Happy Chair today will make it all better. I suppose that I am being overly dramatinc, but every now and then the wave of crap coming my way is bigger than normal, so I need a minute to re-group, hitch up my socks, and ride it out. Today is a day for that. I did go to bed at a decent hour last night, but ended up awake and pondering the damn Greek cookie situation. 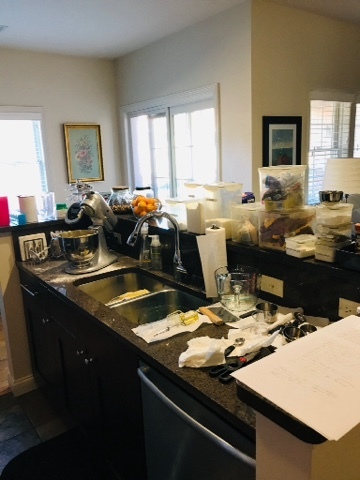 I watched a couple of YouTube videos with various and sundry YaYas (Greek for Grandmother) making them, and I think I have concluded that it is the mixing method that I'm using that's the problem, as well as a flour issue. Stitchy friend Amanda alerted me to the fact that the nice people at Swan's Down have changed the amount of flour that they put into a box (can you believe that she was nice enough to research that for me?! 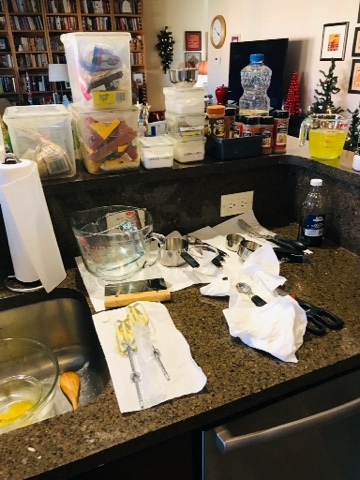 ), and in all the videos I watched, there wasn't a Kitchenaid stand mixer in sight. Just a big huge bowl and a sturdy YaYa mixing the ingredients by hand. Come to think of it, I never actually saw my mom MAKE these damn cookies. I only saw her enjoying one or two with her cup of coffee in the morning at Christmas and Easter time. 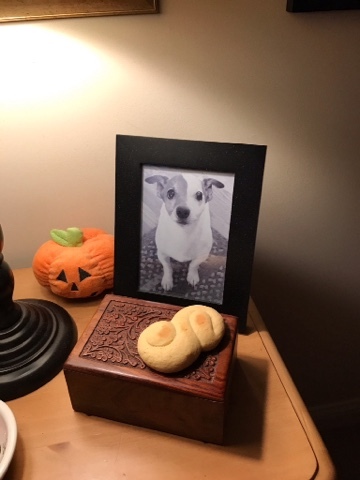 You don't think that somebody else made the damn Greek cookies and sent them to her, do you? With my stupid luck, my Aunt Mary actually made these damn cookies each year and sent them to my mom. 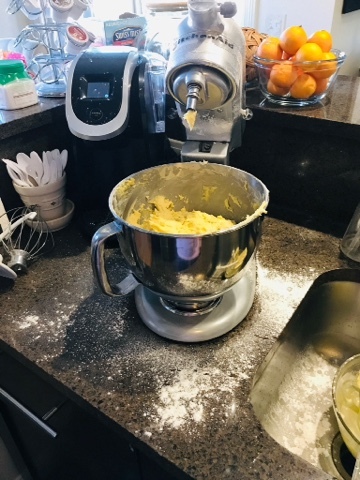 For all I know, the handwritten recipe that I have used and cherished all these years was not, in fact, a treasured family secret, but rather something Mom found on the back of a box of Swan's Freaking Down cake flour. My Dad's cookies will be made on Thursday, and there should be no drama with these whatsoever. There is no treasured family secret handwritten recipe for these because they were sent to him by Minnie Vacario...a neighborlady from Bellefontaine, Ohio. Mrs. Vacrio would shape them into our initials and send them in a big tin, and Dad would try to hide them on top of the fridge or tell us that they had "booze" in them so we didn't scarf them down in one sitting. So on Thursday I will happily and calmly make cuccidatti...Italian fig cookies. The inside filling is nuts and orange peel and chocolate, and the outside dough is buttery and lovely. I don't think I will shape them into initils, but rather cut them small enough that one or two doesn't tip the scale any higher than it is now. On the stitchy front, I am organizing myself for next year already. 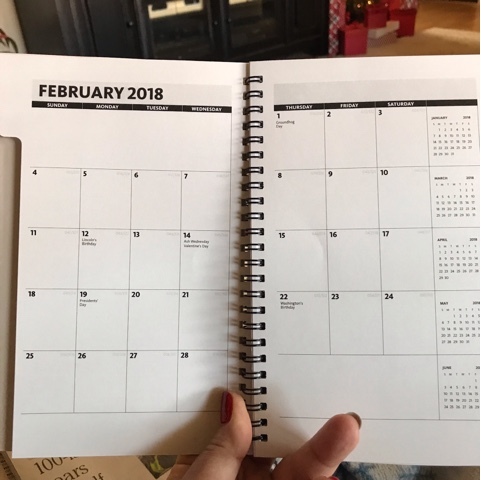 I have this bright idea that I am going to go back to the beginning of this here blog and write down what I was stitching each month every year and if it's not finished...finish it. So in January, I will make a list of all of the stuff I was stitching in Januarys from 2009 to 2018 and that will be my January basket for 2019. 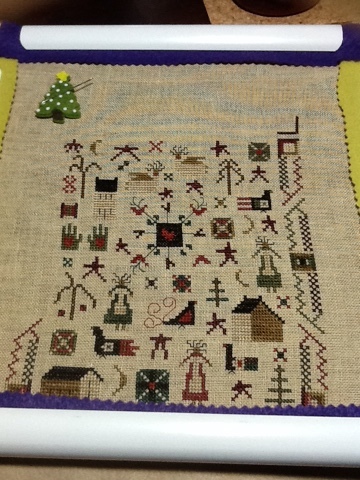 If I stitched it but put it in the box, maybe I'll dig it out and finally get it finish-finished or framed. Well, Dearies...I've blathered on long enough. Time to get on with my TLC day. 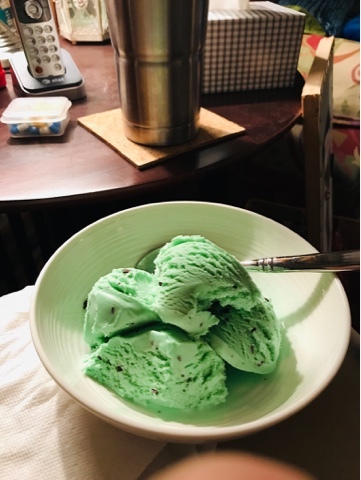 Methinks three or four hours of Outlander or a nice long nap (or both) should do the trick quite nicely, followed by a good healthy dinner and some peppermint ice cream for dessert. Happy Ughday! I hope your week ahead is swell and that you'll come tell me all about it! 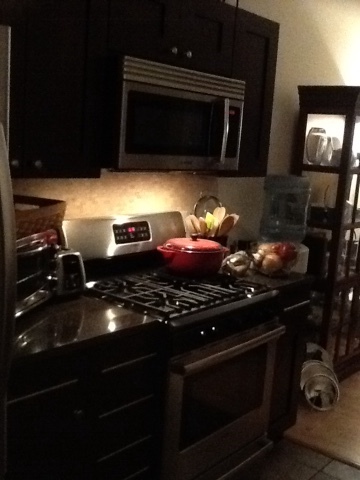 Organize baking supplies...does stacking it all up on the counter count? 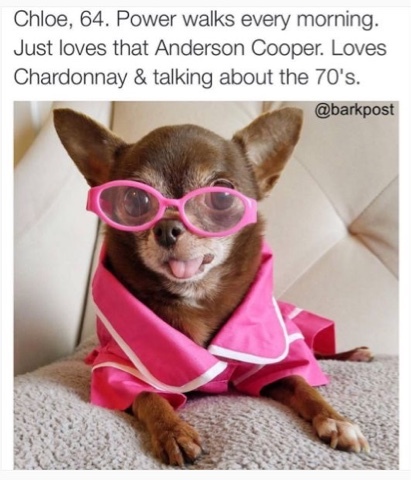 Bake several different kinds of treats and cookies...I don't want to talk about it. Deep condition hair...maybe. I got butter in it by mistake. Can anybody tell me why I do this to myself every year? Poor Magoo was subject to me bashing about and cursing a blue streak as I tried to do a forced-festive day of making my mom's damn Greek cookies. Every year I tell myself that it's going to be different, and every year I inevitably feel very much like Charlie Brown missing the bloody football and ending up flat on my back with stars swirling around my poor round head. Now before you tell me that there are literally thousands of recipes out there for these damn Greek cookies, not a single one of them will be written on the back of Lazarus department store receipt in my mom's beautiful handwriting, and not one of them will call for "a whole box of Swan's Down cake flour" or "get the dough so it isn't sticky". I'm going to master these some day, I swear to you. 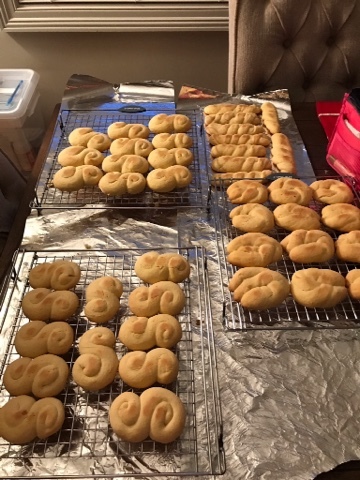 I might be 107 and completely unable to stand upright, but as God is my witness (she says while shaking her dough-ladden fists to the sky), I will have Greek cookies for Christmas and they will be good! As soon as I can stand up again, I am going to take a hot scrubby shower and hit the Happy Chair for some stitchy time before bed. I have to get up at the crack 'o dawn to go see the surgeon who created Buzzy, so I want to make sure to be rested and refreshed to receive whatever news he has to deliver. I hope your Sunday was swell, Dearies! If you made your own damn cookies today I hope they were perfectly delicious and that you are enjoying something lovely with them under a cozy blanket! Come tell me all about it!